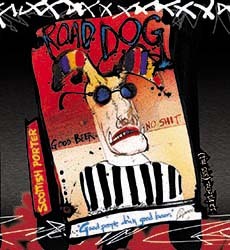 "Road Dog Porter is the original gonzo beer, illustrated by Ralph Steadman and blessed by Hunter S. Thompson. You can read about why this beer was banned by the authorities and the subsequent legal scrap on our Flying Dog story page. This is not a very heady beer. The beer pours a very dark color with no translucence. There are subtle hints of coal, with a very smooth aftertaste. Reviewed on January 31, 2006.